With the trek successfully behind us, we had a free afternoon to do as we wished. Most of our group let their hair down in the Wave Bar, playing pool to music downloaded from their phones and rehearsing the trek rap song led by Hannah (Dahl Baht Power – 24 Hour). I slipped away to explore with 17-year-old pilot Bree, starting at the far end of town near the airport. We spent a happy few hours poking around the bustling line of small shops selling clothing, trekking gear, brightly coloured woollen socks, beanies and jumpers, art, jewellery, handmade Nepalese paper, pashmina shawls, prayer flags, musical instruments and innumerable other handicrafts. At one point, keen to buy a handful of friendship bands for my children and their school friends, I got stuck by my lack of Nepali and the elderly Sherpa woman’s lack of English. 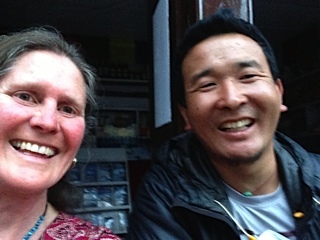 A quietly respectful fellow from the neighbouring Trekking Shop came to my rescue in perfect English. He turned out to be Pemba Sherpa, a long-serving member of the Sagarmatha Pollution Control Committee (SPCC), nearing the end of a five-year term. The SPCC operates right across Sagarmatha National Park and the three surrounding VDCs (Village Development Committees) of Khumjung, Kunde and Tengboche. The Committee receives a percentage of the fees paid by all trekkers and climbers entering Sagarmatha National Park, used to pay the wages of ten garbage collectors and to build the numerous small garbage sheds we saw along the way. More trekkers mean more money but they also mean more garbage. Pemba explained that it is not just the volume but the growing variety of waste now generated that makes life more complicated. Most of the small wrappers on the trail itself come from chip and noodle, sweets and chewing tobacco packets dropped by porters. However, the more intractable volume of waste comes from us trekkers expecting to consume Snickers, Mars bars, Pringles, Sprite, Coke, beer and endless plastic bottles of ‘fresh mountain mineral water’. This is what creates the mountains of plastic, tin, foil and PET bottles that I found by the river early this morning. Traditionally, waste was collected into small scrapes in the ground and burnt. After years of pushing, there are now two professional incinerators, one at Lukla and one at Namche Bazaar. Householders in major towns, like Namche Bazaar and Lukla, pay 3,000 rupees for a weekly rubbish collection and disposal service. Of course, some do not want to pay even this amount (AUD$30) and continue to dump rubbish out of town. The economics remains difficult – porters are paid to carry the plastic, metal and junk up the hill, but not back down again. It’s a long road ahead to achieve stringent pollution control, but the SPCC is making real progress. It would help if Sagarmatha National Park banned mineral water in plastic bottles, as ACAP (the Annapurna Conservation Area Project) has done further west. However, I’ve learnt there are several local water bottling companies, so seeking agreement to a transition to non-plastic bottles (eg steel) may take time. Our tea-house in Pheriche advertised water for refilling your own bottles, purified with UV and ozonation. 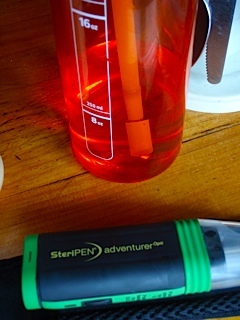 Morgan had brought along an excellent compact battery-operated ‘Steripen’ that purified her water in minutes of swirling. The technology is there, just a matter of setting up conducive conditions for change. Now I’m on a mission – let’s see plastic bottles banned from the Solo Khumbu in the next three years! All those streams and rivers will be cleaner for the next generation, if we start doing the right thing! This entry was posted in Activism, Climate change, Environment, Foreign aid and development and tagged activism, climate change, environment, Nepal by Philippa Rowland. Bookmark the permalink.